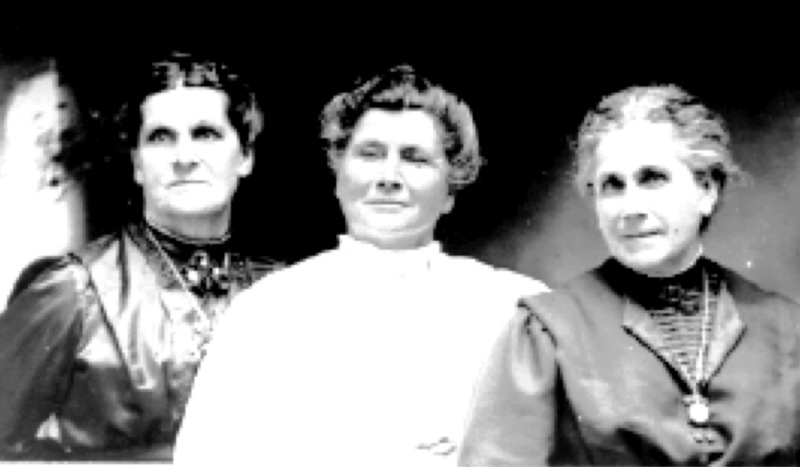 Front row: Ella, Wilhelmine, Emma, Cora. 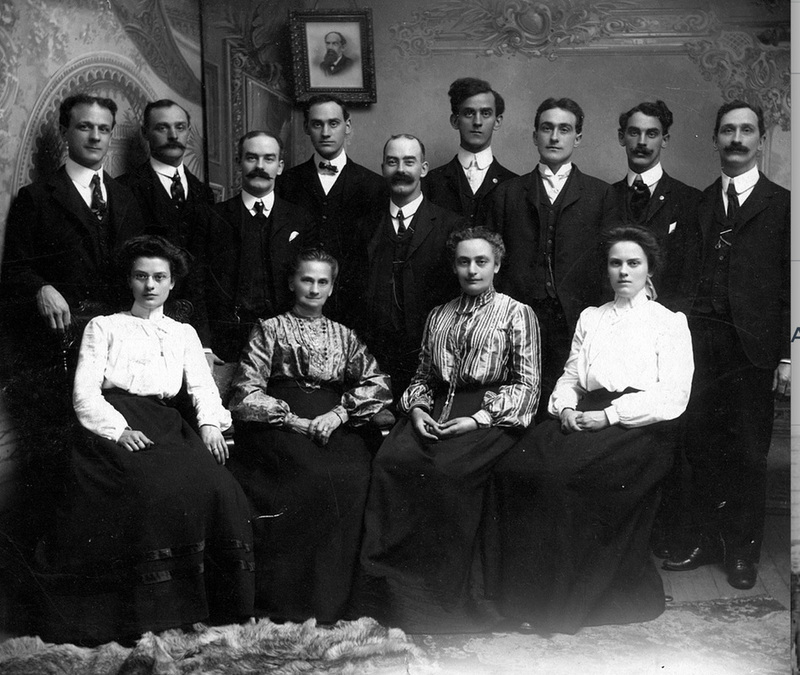 Note photograph of father, Erdman, on wall behind group. 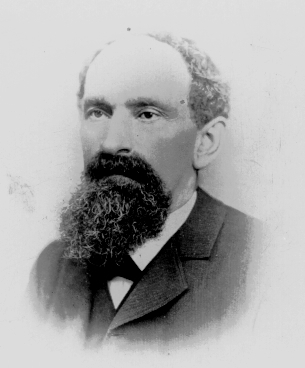 Above: Erdman, only known photo, taken before 1889. 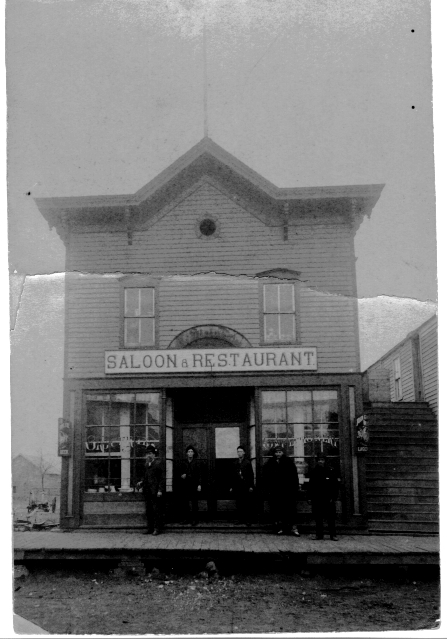 Erdman's saloon, New Richland , Minnesota. 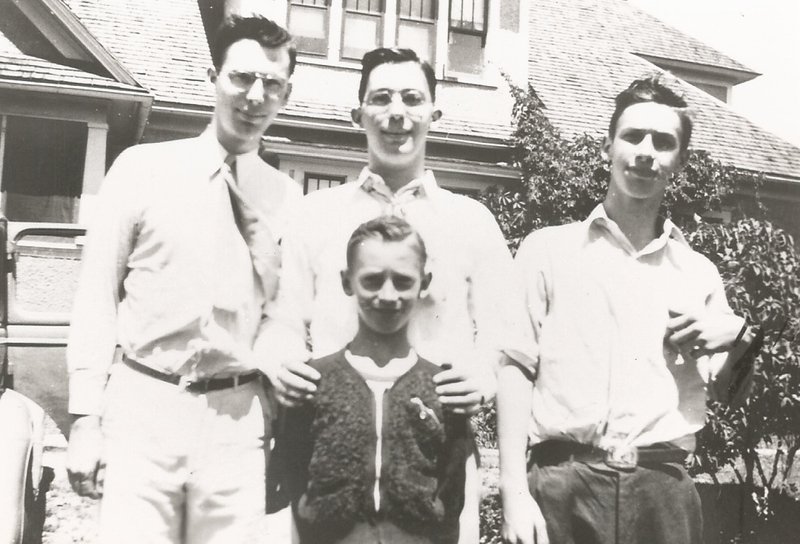 In front from left to right are Erdman Steinhaus, his sons Herman and Emil, Henry Hausaur and --- Krueger. 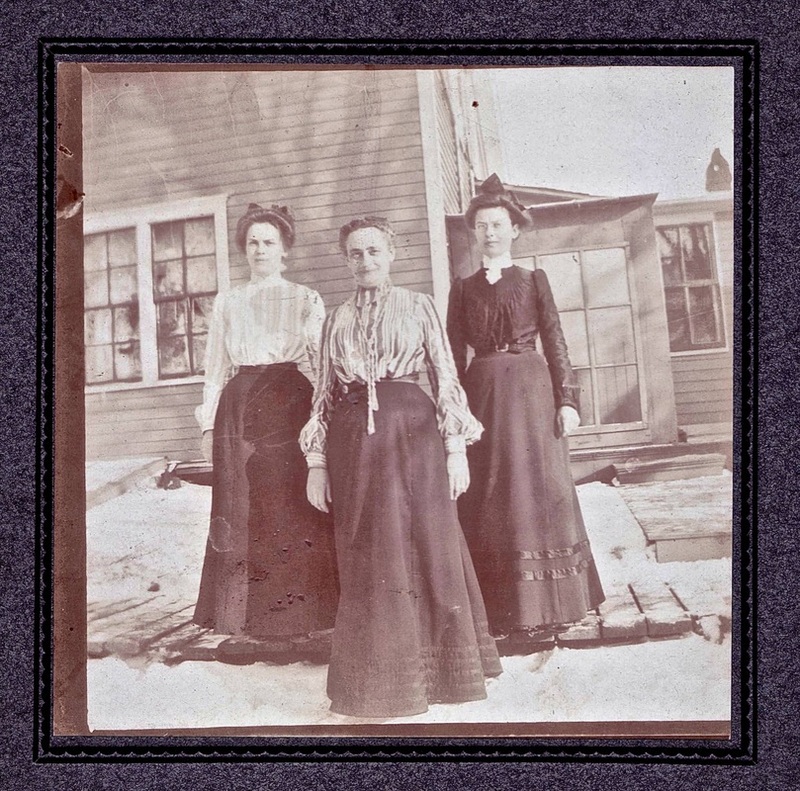 Three half-sisters of Erdman Steinhaus, Minnie Steinhaus Bergner (b. 1865), Pauline Steinhaus Hausauer (1855-1943), and Marie Steinhaus Schwenke (b. 1853). 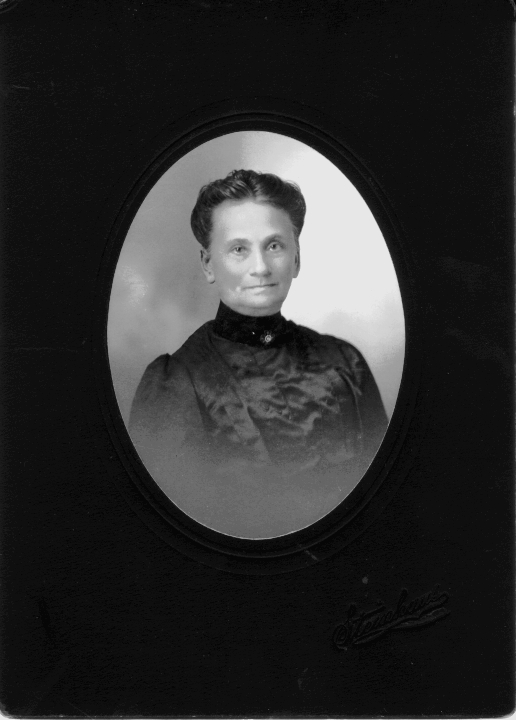 Pauline Steinhaus (1855-1943) married Henry Hausauer (1856-1914) in 1881 in Waseca Co., Minnesota. 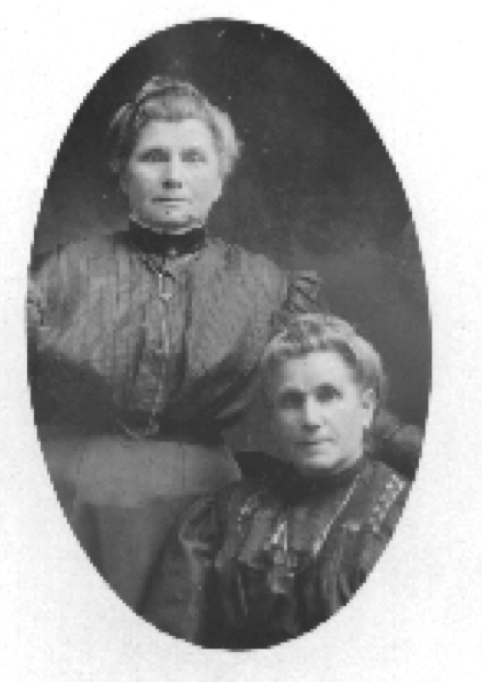 Pauline Hausauer and Marie Swenke, half sisters of Erdman Steinhaus. 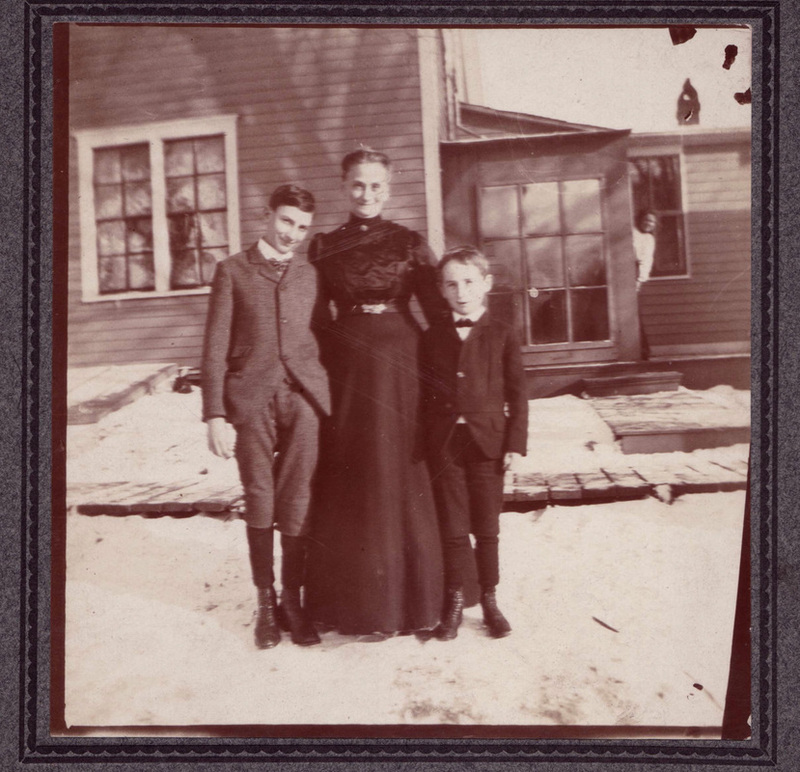 Wilhelmine with grandsons Ernest Hering (son of Emma) and Elmer Steinhaus (son of Gust). From left: Cora, Emma and Ella Steinhaus, New Richland, Minnesota. 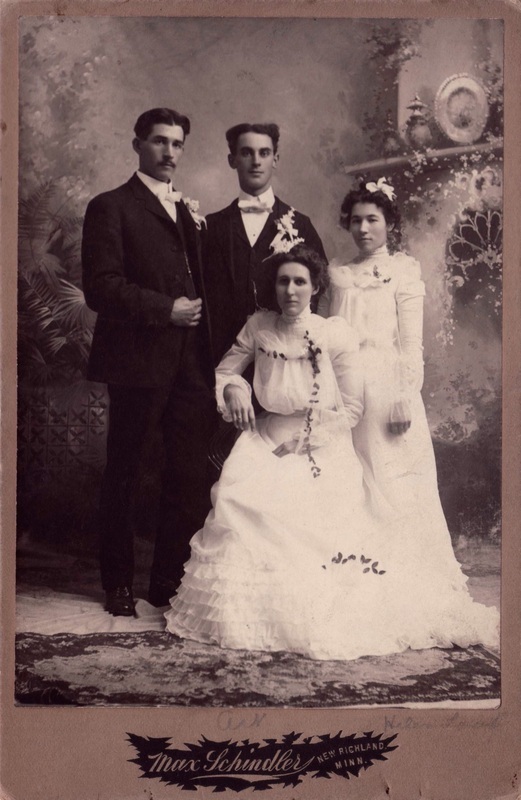 Art married Alice Rhinehart in 1914 in Max, North Dakota. Art and his brother owned a store there and Alice was a teacher at the school. 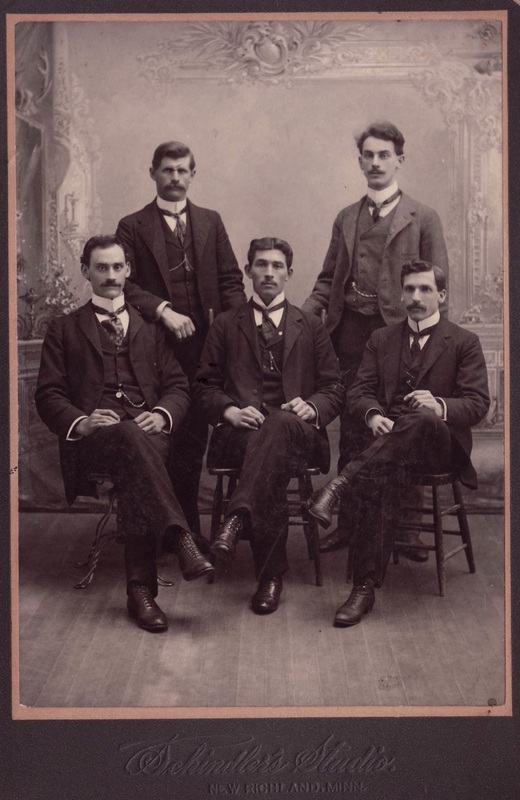 They raised four sons, Edward, Ralph, John and James. They left Max and moved to Berkeley, California, in the late 1940s. 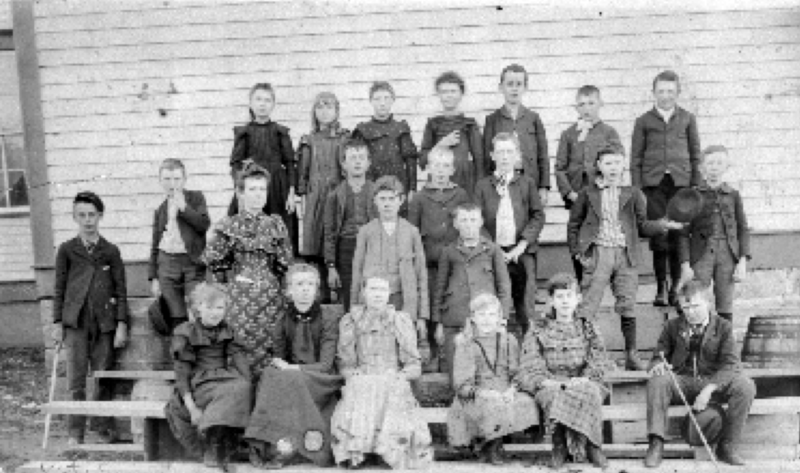 Above: School class, standing at left. Art standing at right. Also included are his brother Ed Steinhaus and Emil Schwenke, a cousin of Art's who was son of Art's aunt Marie who married Henry C. Schwenke. Art, center standing, was the best man at this wedding. 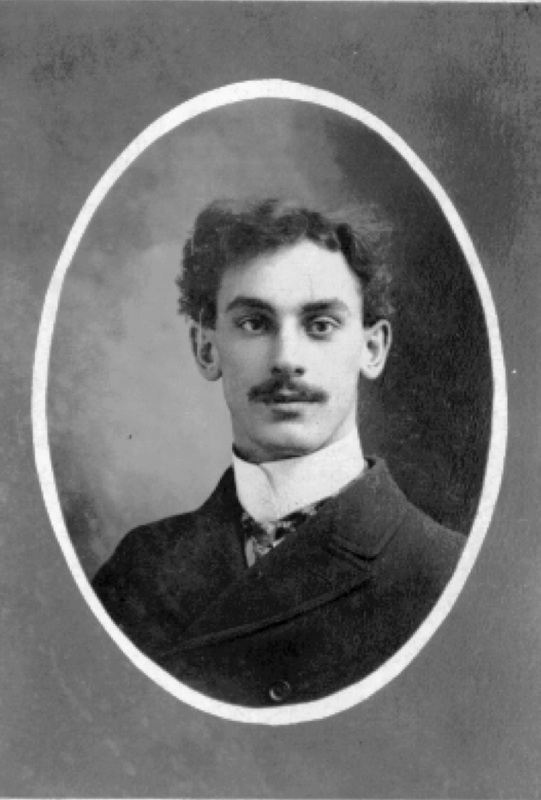 Above an right: Art about age 30 in 1911. Alice and Art in front of Steinhaus Bros store, during World War I. Above and right: Art in about 1948, age 67. Gust was in partnership with brother Art Steinhaus in Max, North Dakota, starting in 1906. They owned and ran the Steinhaus Bros. store with his brother Art. 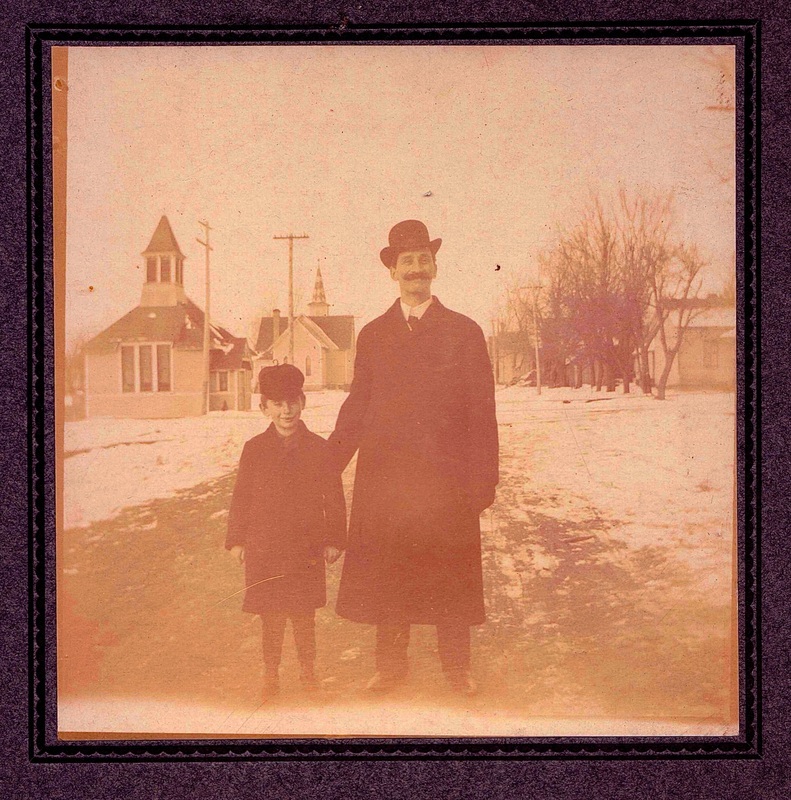 He married Emma Myers in 1896 and they had one child, Elmer. Gust and his son Elmer. 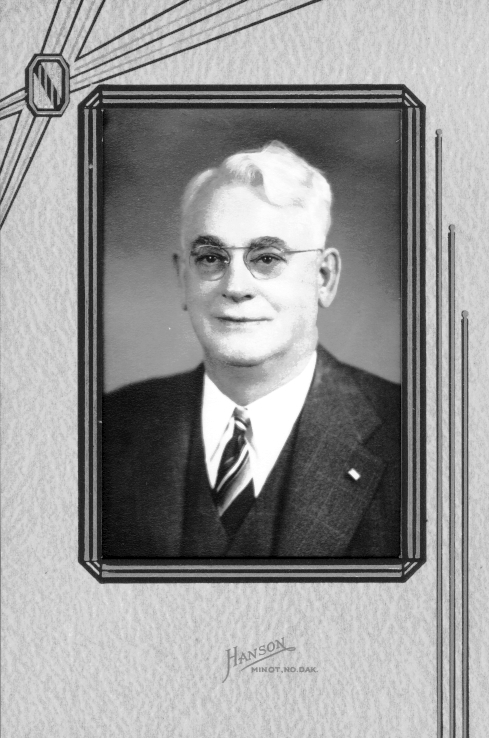 Elmer Steinhaus (1896-1939) married Helen. He was the son of Gust. 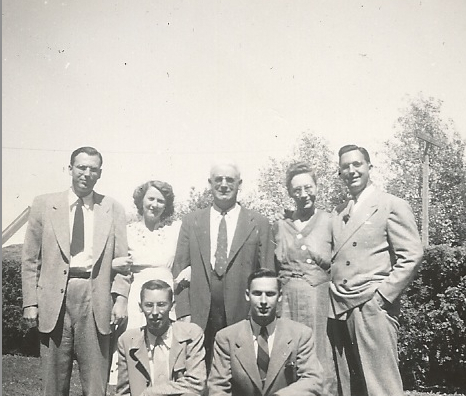 Photo taken 1935 Emma Steinhaus Hering standing in back. 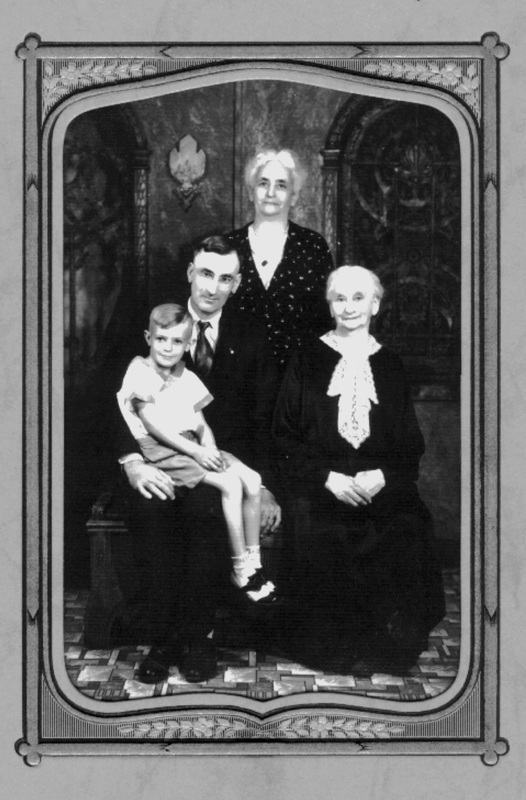 Her son Ernest Hering (1890-1966) is holding his son Leroy Hering (1928-1984). 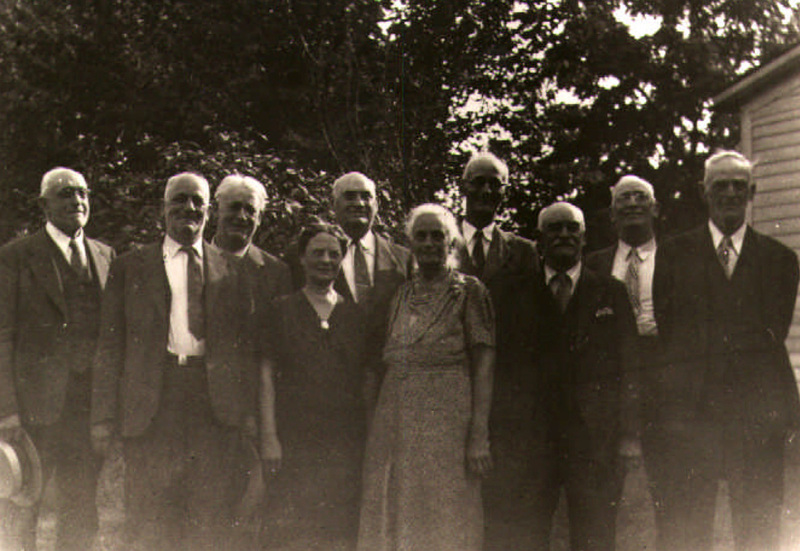 Her mother Wilhelmine Steinhaus is in the front on the right. Emma Steinhaus (1867 - 1948) this photo taken in 1904. Married Rev. Julius Hering in 1890. She had one child, Ernest Hering. Cora Steinhaus (1886-1905) Photo taken about 1904. Albert Steinhaus (1883-1946) in photo from 1904. He married Mary Brown in 1908. They had three children, Ben, Neoma and Duane. 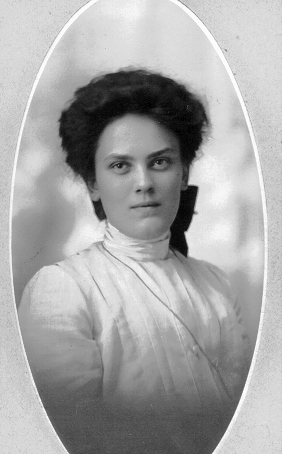 Ella Steinhaus (1884-1979) in photo taken in 1904. She married Leo Weckwerth in 1924. She was the last living among her siblings. She had no children. Wilhelm Bendix Steinhaus (1878-1942) was known as William. He married Bertha Blankenburg in 1915 and they had no children. This photo taken in 1904. Herman Steinhaus (1869-1960). He and his bother Emil were twins. Herman married Clara Just in 1909. They had one child, Esther. 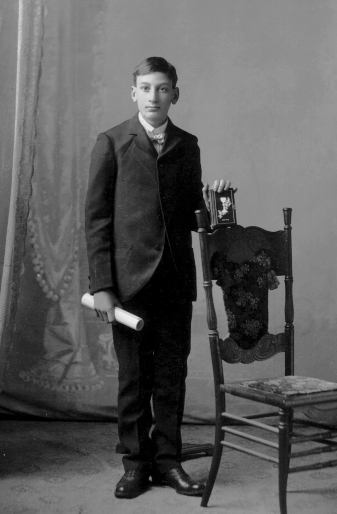 Emil Steinhaus (1869-1941) was a twin of Herman Steinhaus. Emil was a bachelor all his life. Otto Steinhaus (1871-1951) here in photo taken in 1904. 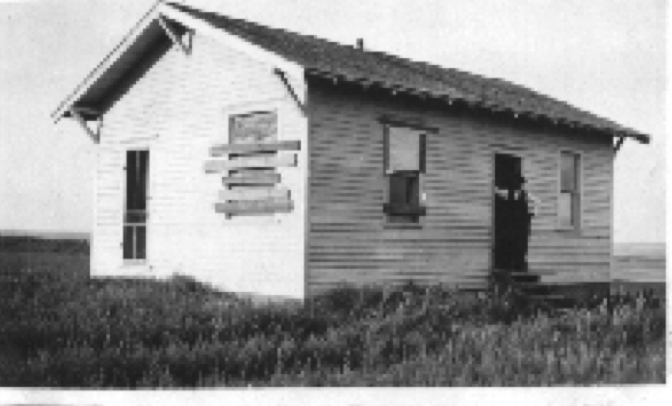 Otto never married and lived on his homestead claim near Van Hook, North Dakota. Homestead near Van Hook, North Dakota. Photo taken after 1919. 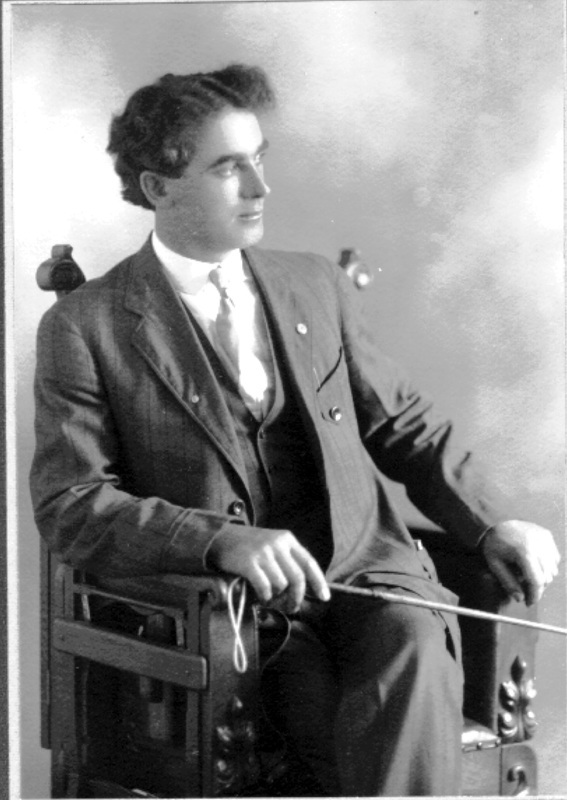 Edwin Steinhaus (1876-1944) married Mable Fish in 1905. They had four children, Roland, Marjorie, Ethel and Herbert. This photo from 1904. 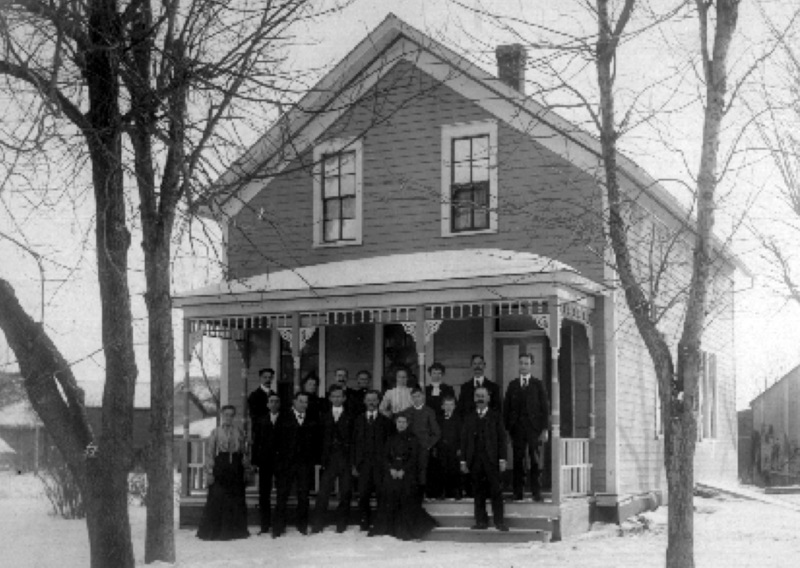 Edwin and Mable Steinhaus at their home in Elysian, North Dakota. 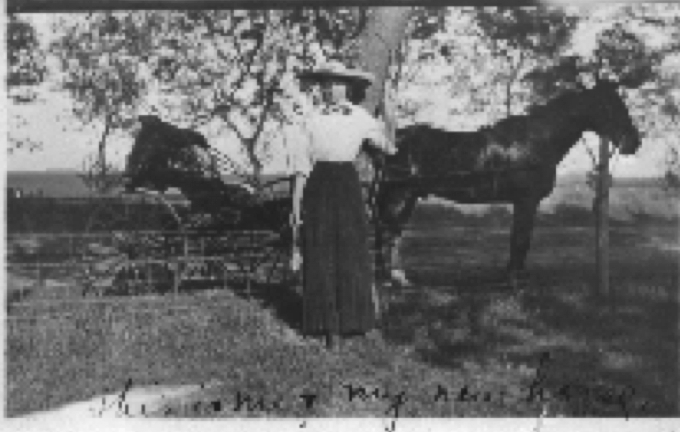 Alice, wife of Art Steinhaus, visiting their homestead claim. This photo after 1919. Louis Steinhaus (1872-1942) known as Louie her in a photo from 1904. He remained single all his life. Brothers Art, Louie and Otto each homesteaded 160-acre pieces of land near Van Hook and Sanish, in Mountrail County northwest of Max, when that former Indian reservation land was opened up for homesteading in 1919. Art and his family established residency on their land but lived most of the time in Max where he operated a store with his brother Gust. Otto and Louie lived on their claims.